NYC, 02/26/2019, 6:00PM. Free-writing workshop. An evening of free-form creative writing! No formal writing experience is required, just enthusiasm and curiosity to see where writing takes you. Each month's Free-Writing workshop will feature a theme to inspire your writing. In our February session, the topic will be food: there's nothing quite like your favorite food, and there's nothing quite like great food writing! Record your culinary experiences using all your senses, our collection of cookbooks, and essays as prompts. This is a relaxed forum to experiment with and strengthen your writing. We offer the option, but not the requirement, to share your work in each session. 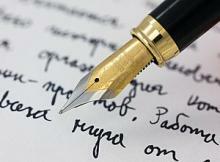 Come write freely and meet other people who love writing for the sake of writing!